Direct Energy Office of The President ([email protected]) sounds powerful doesn’t it? It sounds like you have been given a special connection into the inner sanctum of the people who run the company. If only that was the case. It took almost 6 months for Direct Energy Office of The President to partially resolve the issue we were having due to the Polaris water heater replacement we went through in September 2012. The best news I received was when I got confirmation that we were being put back on the old water heater rental agreement. We were still out over $250 for the new venting associated with the replacement and our monthly rental is now $50 but at least we have the option of telling Direct Energy to come pickup their tank. No more buyout clause! So, why did it take almost 6 months to get to this point? Well, that likely has a lot to do with the inability to get a response in a reasonable time. 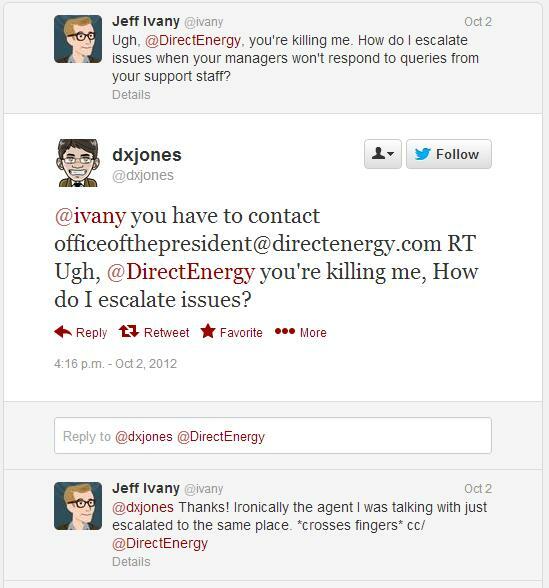 It became very obvious that Direct Energy’s Office of The President is really just a second level phone support group. They really have no power and no ability to do anything. Why do I say this? I had to wait for weeks at a time while my “agent” was trying to get in contact with the “Field Manager” to find out if the “Field Manager” would do anything to address my problem. So, shouldn’t the Office of The President be able to just make decisions and cascade them like any other organization? No. Not when they are just a second level support group. I was getting no where with this group at first, then I started doing my research. If you are having problems with Direct Energy, some of these steps might be useful for you. First, contact Enbridge and have a hold put on the Direct Energy portion of your account. Remember, Enbridge controls all of the money going to Direct Energy from your bill payment. Once you do that, make sure you notify Direct Energy via the Office of The President that you have had a hold applied and why. I don’t remember exactly but I believe the Enbridge payment hold is only valid for one billing cycle after which you need to contact them to have it extended but I’m not sure they will do that so don’t abuse it. Also, I‘m not certain that this really did anything but I did get some rather quick responses from Direct Energy for the next couple days so it’s worth a try. Next, familiarize yourself with the Ministry of Consumer Services, your Consumer Rights and how to cancel a contract. Call them and talk to one of the agents about your specific situation. They can help you understand the Ontario Consumer Protection Act, 2002 as depending on your situation, you will need to reference it. In our case, the agreement that I had signed was misrepresented at the time by the subcontractor. Even when I contacted Direct Energy prior to allowing the tank to be replaced, I was not given a clear response and was not informed that by having the tank replaced, I was basically agreeing to the new rental terms. I laid all of this out in a letter and both faxed and emailed it to the Direct Energy Office of The President. Then you wait. If you don’t get a response from Direct Energy in a reasonable time (one week or so), call the Ministry of Consumer Services and find out what your options are. They can decide to investigate depending on the severity of the issue. So, we finally got back on the old rental agreement and then spent almost 2 months trying to get Direct Energy to come back to replace two of the fittings. That alone was ridiculous as I had my Office of The President contact scheduling appointments for me without checking my availability and then not responding to me for a week when I notified her that I wasn’t going to be available. Eventually I managed to get in direct contact with the subcontractor and we made arrangements for them to come and replace the fittings (the original reason this all started!). And now we’re basically in a sort of limbo – we’re still renting the tank from Direct Energy simply because the cost of replacing our hydronic heating system is simply too much to justify simply to get rid of the rental. 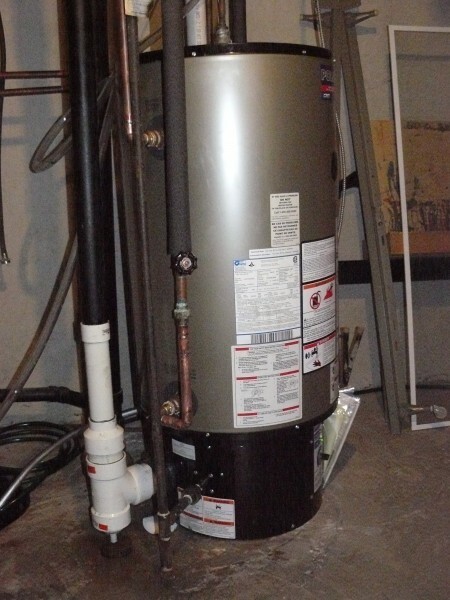 Anything we replace it with wouldn’t even be an upgrade as the Polaris tank is an ultra high efficiency water heater. Oh well. Devil you know I guess. This entry was posted in General and tagged Direct Energy, gas hot water, Ontario, polaris on 2013/06/14 by Jeff Ivany. 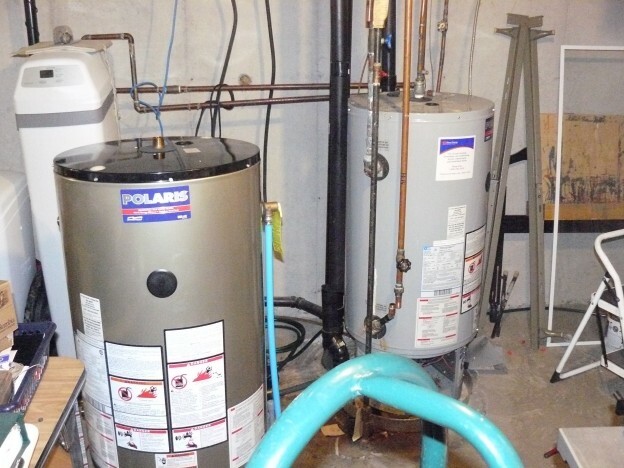 We recently completed a Polaris water heater replacement because Direct Energy decided that our 7 year old Polaris water heater was un-repairable. This post contains information on what happened starting the next day. If you recall from the previous post (liked above), the second technician had ordered a new blower assembly for the original Polaris water heater. Well, that assembly showed up early the next day (Tuesday). My wife just happened to be home and called me just as I arrived at work. We were both baffled by this as if they were planning on replacing our old tank, why did they allow the parts order to go through? The new tank would have been already on the road to our house when that order was placed by the second technician. This is when I realize that something is seriously wrong with what happened the day before. So I call Direct Energy and manage to get connected with Supervisor Victoria. Well, Victoria listens to my story and is also surprised by what has happened. She is very surprised that when I called the rental water heater group before allowing the tank to be installed, I wasn’t informed of everything that was going to happen and what options I had. She can see on my file when I called and I asked if that call would have been recorded. Victoria said everything was so I asked her to pull that call and listen to it. She also looks at my file and informs me that there is no record of who authorized the tank replacement and she is going to need more time to talk to the other people involved on my file so she’s going to call me back the next day (Wednesday). Victoria is true to her word and calls me back on Wednesday. She has talked to many people involved and she still doesn’t know who authorized the replacement but she hasn’t been able to talk to the first technician who had been on site. She also drops the bombshell – we are now on the new rental agreement. 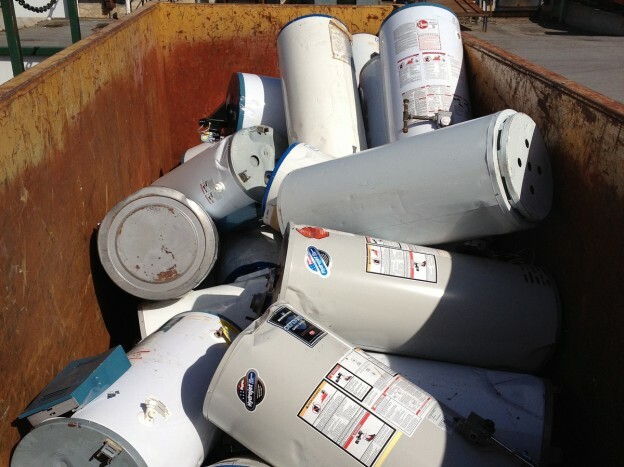 If you’re not familiar with Direct Energy and their rental water heater business – be very, very happy. 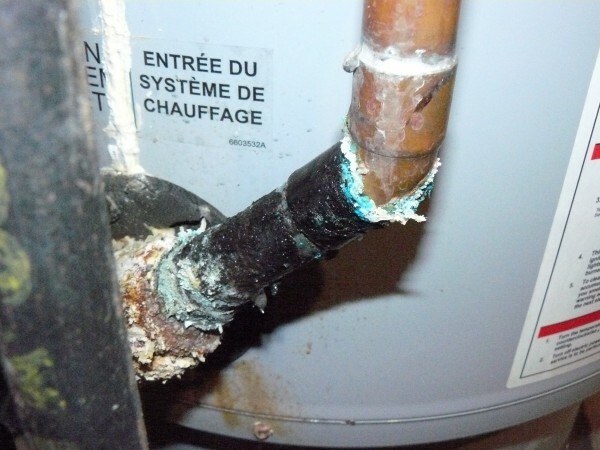 To summarize, being put on the new rental agreement meant that I was now unable to have my rental Polaris water heater removed for a small fee. I was on the hook for the absolutely insane “buyout option”. For example, my just replaced “un-repairable” 7 year old Polaris had a buyout of roughly $3500 (you can buy them new for ~$4500, or less!). I very quickly informed Victoria that this was not acceptable and at no point was I informed that I would be put on the new rental agreement. Her response? “Well, you signed the rental form didn’t you? It has the terms on it”. Crap. I knew I should have listened to my brain. But wait, that’s not how the installer represented the form I was signing. He specifically told me I didn’t need to sign on the “rental agreement line” but just in the work order section for what had been done. But still – crap. Anyways, Victoria decided that she was going to try and find out what happened. At this point, I asked if I needed to get my lawyer involved and she just brushed it off saying that we should be able to come to a resolution without going to lawyers. She was going to get back to me on Friday after talking to the first technician. That was the last I heard from Victoria. I had her direct line and called and left voicemails for the next 5 days. Finally I called the Direct Energy rental group again and got to talk to Wendy. Wendy happened to be in the same office as Victoria and was able to talk to her directly while I was on hold. When Wendy came back, she informed me that Victoria was no longer allowed to talk to customers directly. WTF? So, Wendy was now going to follow-up with the “field manager” and call me back. That was the last I hear from Wendy even with me calling and talking to various other people at the Direct Energy help line. Finally I get fed up and connected with Dixie at the Direct Energy rental group almost 3 weeks after my initial call. I talk to Dixie about what has happened. She informs me that there is no record of me calling the rental water group before allowing the tank to be replaced. We talk about how I was told lawyers weren’t required and we talk about the Ontario Consumer Protection Acts’ 10 day cooling off period and how I’ve now been screwed out of my legal rights due to Direct Energy’s agents (acting on their behalf) implying they would help resolve the issue. Dixie puts a request through to the Office of the President of Direct Energy and says that is my only hope at this point. @dxjones responds to my tweet about how crappy Direct Energy is at doing anything to help me. Oh, there’s more but you’re going to have to come back in a few days to read about Direct Energy’s Office of the President. However, the email address you need to remember is [email protected]. They might be able to help you if you are having real problems. Don’t expect miracles, or prompt service. This entry was posted in General and tagged Direct Energy, gas hot water, Ontario, polaris on 2013/02/28 by Jeff Ivany.